This January marked two important anniversaries. January 11th was suffragist Alice Paul’s 134th birthday (described in the quotation above, from a clipping in her archive at Harvard’s Schlesinger Library). January 19th witnessed the third annual Women’s March. 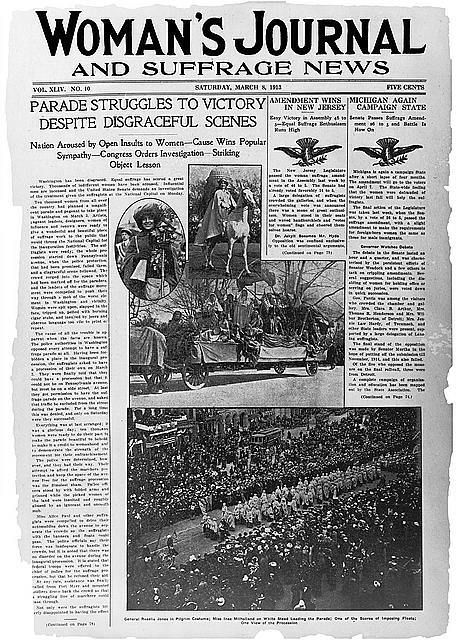 While contemporary women’s marches are organized through viral tweets, websites, and other social media, the parades and protests of Paul’s era used the latest technology of their time: mass produced newspapers. Alice Paul, 1920. Harris & Ewing. Library of Congress, Prints and Photographs Division. In the early 20th century, the increasingly literate American populus devoured sensationalist newspapers (many of which are well-preserved in N-YHS’s archives). Expanding mass media technology made the reproduction of text and photographs widely accessible. In the height of the Progressive Era (1890-1920), reformers used the media to advocate for their causes and gain public support. Historians do not often associate the Progressive Era’s use of mass media with the movement for women’s suffrage that occurred at the same time. However, the women leading the movement for the franchise utilized this powerful tool to their advantage. Front page of the Woman’s Journal and Suffrage News. March 3, 1913. Library of Congress, Prints and Photographs Division. The American women’s suffrage movement began with the Seneca Falls convention in 1848, when women such as Elizabeth Cady Stanton and Susan B. Anthony wrote the “Declaration of Sentiments,” a document modeled off the Declaration of Independence that outlined women’s grievances against the government that refused to grant them electoral power. While these women, and others, continued to advocate for the vote throughout the nineteenth century, they achieved negligible progress, especially as the Civil War and Reconstruction dominated the American political landscape. By the turn of the twentieth century, society generally viewed suffragists as old-fashioned and unpleasant. Across the Atlantic, however, the women’s suffrage campaign was reinvigorated by an organization called the Women’s Social and Political Union (WSPU). In England, suffragists had faced a similar stalling of momentum for women’s suffrage. Thus, Emmeline Pankhurst and her daughters, Christabel, Sylvia and Adela, founded the WSPU in 1903 in order to use “deeds, not words” and employed unprecedented tactics to advocate for the vote. These women became known as “suffragettes” and rather than politely petitioning the government for the right to vote, as other groups had tried and failed to do for decades, they engaged in spectacular public demonstrations to garner attention for their cause. They organized mass marches through London’s Hyde Park and theatrical public demonstrations complete with scripts, costumes and choreography. In the early 1900s, proper ladies never walked in public unescorted—doing so would equate them with prostitutes in the public eye. Therefore, when the suffragettes employed eye-catching tactics to advocate for the vote and attract media visibility, they faced derision and scorn. Americans shared similar prejudices with the British regarding women in public; indeed, amid the social upheaval caused by increasing urbanization and industrialization at the turn of the twentieth century, well-to-do members of American society remained wedded to Victorian strictures that relegated women to the domestic sphere. Even female suffragists, who ardently desired to extend the franchise to women, were apprehensive about engaging in public demonstrations for suffrage like their British counterparts. Carrie Chapman Catt, an influential American suffragist, remarked in 1909, “‘we do not have to win sympathy by parading ourselves like the street cleaning department!’” Thus, the American women’s suffrage campaign persisted rather quietly, while more flashy news events scored headline after headline. 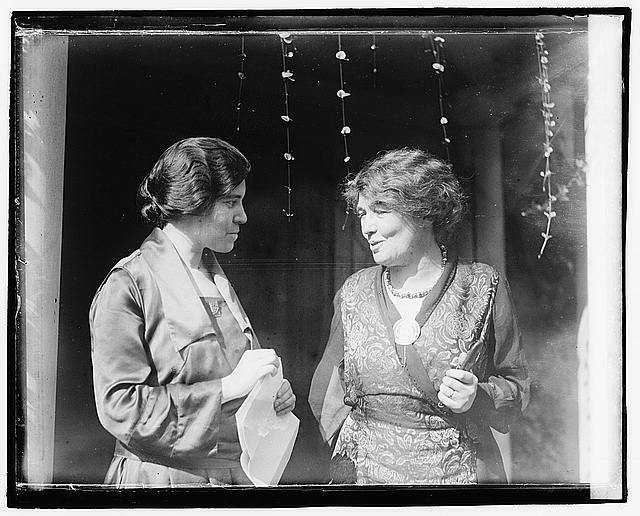 Alice Paul (left) with British suffragist Emmeline Pethick-Laurence, 1920. National Photo Company. Library of Congress, Prints and Photographs Division. What does the WSPU and suffrage activism in England have to do with the American women’s suffrage movement? A key character who bridges this gap, and represents the transatlantic feminist networks that began developing in this time, is Alice Paul. A New Jersey native and graduate of Swarthmore College and the University of Pennsylvania, twenty three year-old Paul traveled to England in 1907 to study social work at the University of Birmingham. During her time abroad, Paul encountered the WSPU, whose members encompassed diverse classes of women, from titled aristocrats to poor mill workers. As Paul engaged in public demonstrations, marches, and meetings, sometimes resulting in arrests and jailings in London, the American press took note, publishing numerous articles about her back home. “Miss Paul Stirs London,” the headlines read. “Miss Alice Paul Tells of Tube Feeding.” Then, in 1910, the papers reported, “Miss Paul to Make First Speech Here.” Indeed, Alice Paul, suddenly a local celebrity, was coming home, bringing with her the experiences she gained with the WSPU in England. Conscientious of the rise of her own local celebrity and a participant in America’s mass-circulation newspaper sensation, Alice Paul set out to organize what would become one of the most performative, spectacular, and influential demonstrations in American women’s suffrage history: a march on Washington, D.C. to express opposition to the election of anti-suffrage President Woodrow Wilson. Employing the tactics innovated by the WSPU, the march would be a theatrical dramatization of political desire, with the women themselves serving as the performers. Woman suffrage parade, Washington, D.C. 1913. G.V. Buck. Library of Congress, Prints and Photographs Division. Five thousand suffragists arrived in Washington to demonstrate, some of whom notoriously hiked all the way from New York to join in the procession. Speakers included Helen Keller, the Reverend Dr. Anna Howard Shaw, and on March 3, 1913 just four years after her expression of opposition to public demonstrations, even Carrie Chapman Catt would take to the stand. Leaders organized the event with emphasis on performance and pageantry; women sported costumes and sang songs. 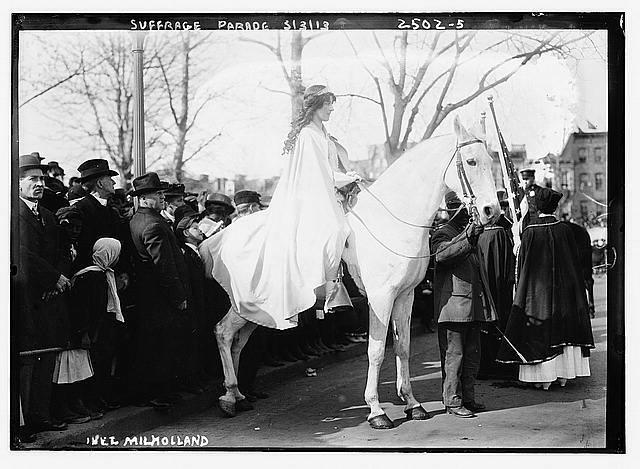 Suffragist Inez Milholland dressed in an iconic costume as the eternal beauty, Helen of Troy, and she rode into Washington atop a white horse. 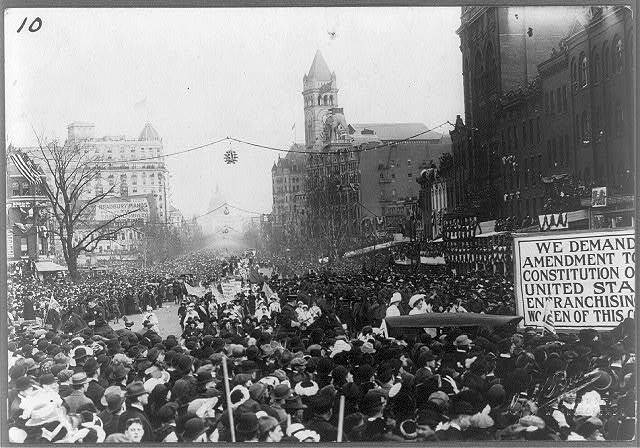 Inez Milholland at Suffrage Parade, Washington, D.C., March 3, 1913. Bain News Service. Library of Congress, Prints and Photographs Division. While Paul and other leaders successfully attracted public attention, with estimates of 100,000 male spectators lining Pennsylvania Avenue, the 5,000 suffragists were not kindly received. Many of the men were inebriated after the inaugural festivities and they “heckled, spat, threw objects, and eventually broke through the meager police lines.” In a statement for the New York Times the following day, Dr. Anna Howard Shaw stated, “There was certainly no effort made to protect us…but [the police] were not taken unawares because they were besieged with demands to give us protection.” Ultimately, over one hundred women were hospitalized. Women’s March on Washington, 2017, via Wikimedia Commons. The Women’s Procession did not achieve votes for women; in fact, women would spend another seven years advocating for suffrage, through tortuous time in jail, undergoing hunger strikes and force feedings and enduring heckling and harassment during their public demonstrations. Moreover, the women’s suffrage movement did not exist in a vacuum; suffrage leaders were not exempt from the biases and prejudices that dominated social and political interactions at the turn of the twentieth century. African American activists, including Ida B. Wells, endured discrimination among suffragists. The African American delegation at the Women’s Procession was forced to march in the back, behind the white leaders. Alice Paul was not an infallible heroine, and several of her decisions would be seen as racist today. Still, by the time the Nineteenth Amendment was signed into law in 1920, concluding a fight for equality that began before the Civil War, Paul had revolutionized the way American women would advocate for the vote. By taking advantage of the popular press and playing on her experience with celebrity, Paul transformed the suffrage movement into a public spectacle. The iconic images of women’s marches have by no means disappeared in the near-century since suffrage. Transatlantic feminist networks helped to bring about the ultimate winning of women’s right to vote, and today, international women’s demonstrations continue to capture the public imagination through our own generation’s version of the sensational press: social media. Top image credit: Suffrage Parade, 1913 (detail). Bain News Service. Library of Congress, Prints and Photographs Division. Excellent piece, thank you! Let us always remember, “ Well behaved women seldom make history,” said Laurel Thatcher Ulrich, Harvard University!